Sheli Lulkin (1935- 2016) was born in Israel and moved with her family to the United States, arriving on the West Coast before coming to Chicago where other family members already lived. She grew up on the North Side, attending Roosevelt High School and the Chicago Teachers’ College. Lulkin became a special education teacher in the Chicago Public Schools and an active member of the Chicago Teachers Union, in which she served as an officer. Lulkin was also a founder and leader of the Coalition of Labor Union Women (CLUW) and served as editor of Chicago Education News. She advocated for the Equal Rights Amendment and was active in various other committees focused on women’s issues. Lulkin came to Edgewater as a graduate student in political science at Loyola University. Once established here, she became a force for change. One of Lulkin’s first forays into community affairs was as a member of the Save Our Cemetery Committee advocating against the sale of parts of Rosehill Cemetery. Her next efforts addressed flooding issues on Sheridan Road. Lake Michigan’s rising water levels combined with high waves during severe storms caused problems not only for Sheridan Road condo owners, but also for the safety of the entire community. 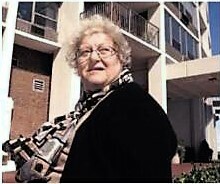 A founding member and long-time president of the Association of Sheridan Condominium/Co-op Owners (ASCO), Lulkin galvanized Edgewater residents to work with various local, statewide and federal officials to build new revetments and offshore breakwaters to protect the shoreline from further erosion. Lulkin became a community convener for Congressman Sidney Yates’ task force for the lakefront and executive director of the Edgewater Chamber of Commerce. She was active in many other community organizations, often in leadership roles, including the Illinois Condominium Advisory Council, Lincoln Park Advisory Council, Organization of the North East, and Friends of the Park. She received the Lifetime Achievement Award from the Edgewater Chamber of Commerce in 2010, was named to the City of Chicago’s Senior Citizen Hall of Fame in 2012, and honored as a Living Treasure by the Edgewater Historical Society in 2013. Many of the records from her public service have been preserved for posterity at Loyola University. Her tireless dedication helped improve the quality of life in Edgewater.